NEET 2019 application: NEET is a single stage exam conducted usually on 1st Sunday of May. Consisting of one paper with 180 objective type questions with 45 questions each from Physics, Chemistry, and Biology (Botany and Zoology) respectively. Allotted time for NEET exam is 3 hrs. Each question carries 4 marks, with -1 for each incorrect answer. The NEET 2019 application fee is specified for General and OBC category candidate is 1400/- and for SC/ST/PH category candidates it is Rs. 750/-. In order to apply for NEET 2019 application, you should check whether or not you are eligible for it. Most of the criteria remain the same over the years with an exception of few, which is why make sure to visit the official website of NEET. o Aadhar Card or any other Government approved ID proof. o 10th and 12th Certificate. o Scanned Photograph and Signature. · Candidates can either go with online mode of payment or offline mode of payment. In case you are going with online payment then you must have a debit card/credit card ready for payment. The NEET UG 2019 application fee is specified for General and OBC category candidate is 1400/- and for SC/ST/PH category candidates it is Rs. 750/-. Candidates can also make necessary payment in offline mode through challan at bank or e-post office. Depends on the way you want to pay. · In case of any correction to the NEET application form 2019, it can only be made during the correction period. The correction will be allowed only in some fields. 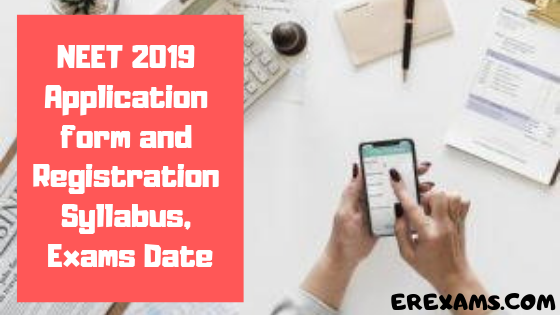 · NEET 2019 Application form once submitted cannot be withdrawn. · All procedures begin from your NEET official site. So, the first step is to visit the official website link. · As soon as the application form page opens up, read the instructions carefully and click on the “Proceed to Apply Online NEET (UG) 2019”. · Enter all the registration details and click on the “Preview & Next” button to submit and go ahead. · Now, after completing the registration process, log in again with your registration number and password to fill the details further. · Fill other required details like personal, communication, exam center, qualification, etc to continue. · Upload the scanned images of photograph and signature in the prescribed format. · After uploading the images, go to the “Make Payment” section and read it carefully. · Now is the time that you choose your payment mode, i.e. debit card, credit card, net banking or e-challan and pay the application fee. The NEET 2019 application fee is specified for General and OBC category candidate is 1400/- and for SC/ST/PH category candidates it is Rs. 750/-. · Once the fee payment is done, proceed for the “Print Confirmation Page” section. You are almost done now. · Click on the link “Click here to take Printout of Confirmation Page” and take a printout of it for further use. You will need this application form in your next proceedings for the exam. Keep it safe. Earlier last year, the Central Board of Secondary Education (CBSE) had added 23 new examination cities to the existing 80 examination cities of NEET 2017. The official press release states that “looking into a substantial increase in NEET aspirants this year, Ministry of Human Resource and Development, Government of India has increased 24 examination cities of NEET 2019.” So, candidates can edit the chosen examination city and may add a new city of their choice from the list of total 104 examination centres. Please note that during the application form procedure, candidates would have to choose at least 3 exam convenient city codes for the entrance test. The exam conducting authority will make every effort to allot an exam centre in one of the places selected by the candidate, but still, the CBSE reserves its discretion to allot a centre other than the candidate’s choice if required. It is important to refer to the codes of test cities and write the appropriate code in the space provided in the NEET 2019 application form. After completion of the NEET examination, the counselling procedure for admission to various medical and dental colleges for the corresponding academic year is held. The students are selected to colleges based on their rankings and merit.